Spatial Drone 3 is a synthesizer and tuba improvisation which excites the fundamental resonant frequencies of a given architectural space. This is an improvisation which aims to subject a stationary audience to a range of body-listening experiences by putting the room into a range of contrasting resonant vibratory states. During this experience, the audience becomes explicitly bound to the space through vibration. The audience both hears and feels the materiality of the space. The audience is made to resonate sympathetically with the space. Spatial drone is a translation of personal to collective perception of space through sound: The synthesiser and tuba players spend time in a space and intuitively locate the strongest resonances of that space through audition and perception rather than acoustic measurement. These resonances are first perceived, and second internalized as sensations, bodily and aural, that express and convey the spatial configuration through sound. 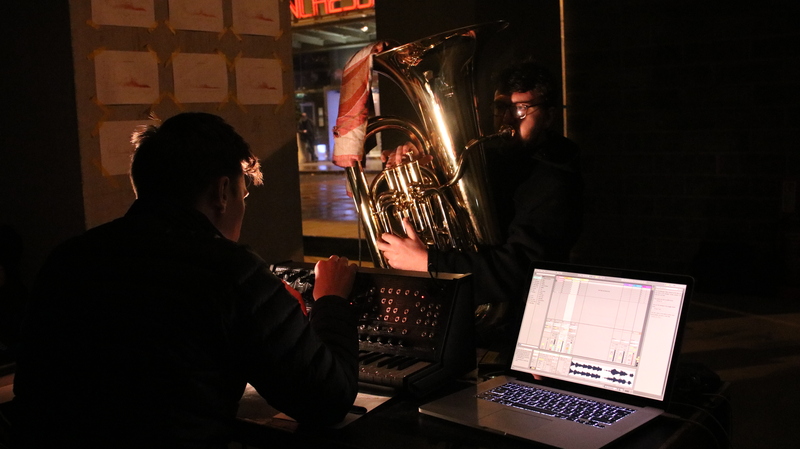 In this version of Spatial Drone, the synthesiser and tuba improvise with each other according to a number of constraints which are devices to resonate the space in different ways. 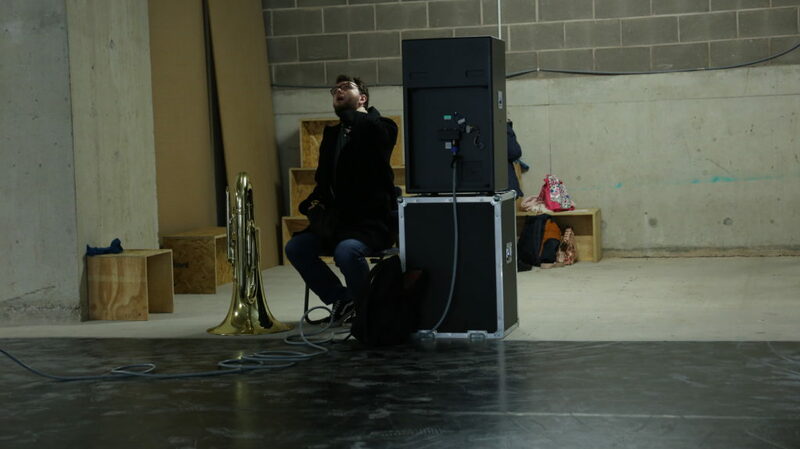 In one section, the synthesiser is plays fundamental frequencies of the space whilst the tuba creates beating patterns against them, causing the space to throb, and changing the interference distribution pattern in the space. In another section, the synthesiser and tuba create harmonies by playing different combinations of resonant frequencies together. The improvisation loosely follows the structure of an Indian classical improvisation. The opening section is based on an ‘alaap’, where the raga is rendered for the first time. In this instance, the fundamental frequencies of the space are herd one by one with sweeping dynamic arches. Alex: And did you feel the sound moving across you at all? JS: A little bit, not a lot. There were certain frequencies that got your ears. Um, just a feeling in your ear like pressure. –Yeah there were some weird pressure moments actually; feeling like when you’re driving up a long hill and your ears pop. There were similar kinds of feelings where the pressure just changed really quickly, it was really interesting. ADL: And did you kind of […] feel like it linked you to the space; did you feel the space being excited, or was it just the sound? Or you even care or think about it? It doesn’t matter if you didn’t. It’s not a trick question. JS: I don’t think that I thought about it consciously, it was just as though I was connected to the space in that […] Yeah I’d say so, although I wasn’t consciously thinking about it. ADL: I mean you objectively were being connected to the space, you know, by the fact that you know, the space was in resonance. JS: Yeah, but I wasn’t really think so analytically about it, just experiencing it. I was very aware that I was in the space. Um. And there were certain frequencies that excited it, yeah. ADL: It [making the space resonate using the synthesizer in the first performance] was quite a random process, like shining a torch around and seeing what gets illuminated. And [as the process unfolds] you kind of forget what you shone it on before, you shine it on something else, and then you go back to an idea in a different way, and then you go somewhere else. And all in the frame of like trying to do this certain thing. Which is why I think it’s interesting that we’re doing this session off the back of you having heard it [the first performance of Spatial drone]. I think it makes it much easier for you to understand what the piece is trying to do […] Because I haven’t had that experience that you’ve had with it. JS: And if you were to, you would be thinking about it in a different way because you’ve done it. ADL: But I think on reflection, let’s keep it closeish to that [points at the sketched structure in notebook]. I think the free thing is good, but I don’t want us to finish the performance and think, ‘oh we should have evoked that [idea] more clearly, or this more clearly’. The only think that I didn’t include in that [sketch] is the idea of these cutoff sweeps that I was doing so I think that that should go into the structure somewhere. These things [plays a cutoff sweep]. The kind of automation of it. Which is quite interesting from a musical point of view because it created a framework for you to work around. ADL: I can vary the quality of it. [plays]. I want to avoid making ever it sound too ‘synthy’. ADL: Yeah because then you’re hearing a synth and not the space. JS: Because then you think synthesizer, you think Brian Eno. ADL: And it’s like that with the Tuba, you don’t ever want to hear a tuba, you just want to hear the space. All we’re doing. There are two things we’re doing. The first is […] all the loudspeakers do –and the reason they point away from the audience– is they set the space into vibration, different states of resonant vibration. Secondly, these states of vibration affect the audience. They target the audience. But, you stop becoming a tuba player and start becoming an exciter of the room. And that’s the mind frame isn’t it. Which is a different mind frame. JS: It’s cool. I like it. What’s this word that you put in here [points at the sketch], steady? ADL: Steady state. So the idea that you start, with an exploratory […] so you’re introducing the [resonant] frequencies to the audience one by one, bending in and out is really important I think. It would be as interesting in some ways if you found very resonant notes to start with. Like what’s the least resonant note you can find. And then play a really resonant one and compare them. ADL: And then bend in and out. Increase dynamic envelope, decrease dynamic envelope. Change overtones. Use a mute, don’t use a mute. All these kinds of ideas. These are just a guide. Within that do what the hell you want. And then I’ll come in and slowly establish a resonance. I’ve only been using G because I think G is the strongest. JS: Yeah I was sometimes using C because I thought it was fairly G but then I was like, ‘okay it’s not really doing anything’. ADL: The C has Gs in it right [due to the overtone series present in the synth and the waveforms used by the synthesiser]? So the fundamental of the C I think is too low for your instrument to evoke. But if I play you the C [plays fundamental of C]. That’s the fundamental of the C and that’s […} That’s there isn’t it. ADL: But that’s not as strong as the fundamental of the G which is this [plays the G fundamental frequency and it’s much, much louder]. I didn’t do anything to the volume there. That’s all resonance. ADL: So I’ll establish that in a very steady way and I think I’ll just stay on the G. Because it’s using the strongest resonance. I don’t want to get in the way of you, I want to come in underneath you and start subtly. I like the idea that the resonance gets stronger and stronger, then it’s established, then after it’s established, we mess with its state, so the harmonic things is I suppose making comparison between the sensations of different resonant frequencies, so like you might be down in the bottom and I might be going like kind of [plays through a range of high frequencies]. JS: Yeah there were time when I was playing in my middle register and I was still getting some effect against you, but then it’s not as strong as down at the bottom. JS: Just to do what I was doing at the beginning. Sounds cool. Um. I was trying to […] trying not to come in too strong, but that can be really hard. Do you mind occasional strong entries? ADL: No, I mean I think that’s. I think you’re limited by what your instrument can do and if it’s telling you strong entries, then do strong entries. You’re not a synthesizer. I think the other thing about this piece that I think is cool is the humanness of what you’re doing versus the really fixed-ness of this. And whilst this can target, like, target the frequencies exactly and create envelope exactly and partials and waveforms and modulation and all of that stuff. [with the tuba], there’s a humanness to the fact that there’s a breath that runs out […] and that’s why I don’t want to get in the way and also there should be some windows in the thing where I just come out and show you on your own. I think there should be sections where you are underpinned by me and sections where you are on your own. […] Because you’ve got no choice but to sound like a tuba. And there’s a certain thing that that brings. But I mean obviously I have eq’ed you loads. And you’re quite compressed as well. The compression means that you don’t overblow. You maintain quite a consistent dynamic level. JS It’s fun to jump octaves. ADL: the change in octaves on the tuba is just an emphasis on a different partial of a same waveform. You begin to think of the tuba in terms of acoustics rather than notes.